The Ford Focus is one of the best selling cars on the market; it has been that way for a long time now, it’s roomy and handles extremely well. It also manages to appeal to Parents and modifiers alike, but if you want all that wrapped up in an even more practical package you need a C-Max. The MAV sector as it’s called (Multi-activity vehicle) is a hotly contested area in car sales, most manufacturers bring out some version of big hatch back, but Ford were there since the beginning with the C-Max. It’s based on the Focus throughout, but it’s longer and taller. The exterior is a nice package, it has a very tidy footprint, with the spot lamps and alloys added it looks almost sporty. The boot space is a massive 550ltr, there’s a low boot lip for easy loading. In the front it’s got all the common Ford equipment, apart from the stereo in the one I’m driving is a lovely sounding Pioneer, the main difference is the seating position. You are higher up and more above the pedals; it feels more like a van driving position, but you’re behind the steering wheel instead of above it like a van. It’s very easy to find a comfy spot, even if it’s not your preferred spot it’s still comfy. The seat squab is firm but the back of the seat is soft. There’s plenty of storage too, cubby holes everywhere, even on the top of the dash. The back seat is very smart, in normal position there’s a tonne of room for 3 adults in the back, but when you want to the two outer seats move forward and out. This increases the boot space but more importantly makes the back seat wider. There is also tray tables set into the back of the drivers and passenger seats, all in all the rear of the car are a nice place to sit. On the road the 1.6ltr diesel does a good job of shifting the car along, it’s quiet too. The driving position means visibility is superb; the 5 speed gearbox is snappy with a light clutch means easy town driving. 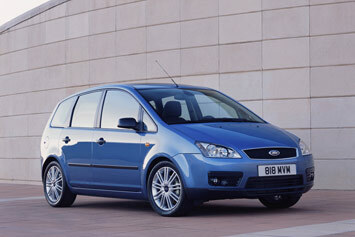 The C-Max manages to be comfortable on the road without being too firm. Once you get up to speed the cabin is quiet, there’s very little road noise. It’s thrifty too, you will easily get 50mpg in real world driving and that’s very good for a big car. Out on the motorway you would think you were driving a much bigger car, it’s solid and nippy. Once you get onto the back roads that reliable Ford handling starts kicking in, it turns like a Focus hatchback, the handling is brilliant for a car in this sector. While most of the other MAV cars wallow in the corners the C-Max stays level, with plenty of feedback from the steering you won’t mind travelling fast in it. Testament to the Ford build quality everything in the cabin still works, there were no shakes or rattles, and that’s saying something usually these kind of cars get treated very hard, the kids in the back can reduce most cars to their component parts in a few months, not so with this C-Max it’s still in great condition. What seems from the exterior to be a small car is like a Tardis in the interior, the Renault Scenic is the usual benchmark in this category but I think the C-Max is more than a match, the Scenic dated very quickly but the Ford still looks sharp, couple that to the far superior driving experience and the C-Max is hard to beat. The car I drove is available from Downey’s Auto stop in Portlaoise, for more information contact Gerry on 0578622048, you can also find it on Carzone.